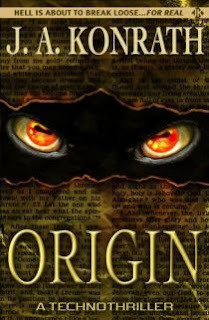 It's been a while since I've read a thriller as entertaining as Origin . Konrath successfully combined the science of Jurassic Park with the beast of Relic. There were several elements of Origin that pulled me right out of the story at times, but the suspense and my curiosity pulled me right back in. I got a pdf ebook from Konrath's website for free, but you can also get other formats (Kindle, Nook, etc.) for super cheap. If you are a fan of techothrillers, horror, or suspense, I recommend you check it out. This was my first Konrath novel. Have you read Origin? Do you have a favorite Konrath book you can recommend? I haven't read anything by this author. This sounds like a great read. Ann, it was my first Konrath, but I will definitely be checking out more of his work. If you are looking for some over the top vampire action thriller, you could try DRACULAS. It was a big hit when it came out this past summer. It's a collaboration with Konrath, Blake Crouch, F. Paul Wilson and Jeff Strand. TRAPPED was another good one. It's a thriller about a group that ends up trapped on an island with hungry cannibals and a mad scientist. Great, thanks! I will be checking those out.